The biggest hurdle The Help has to overcome is the criticism levied against similar films such as The Blind Side and Avatar: pandering to the audience by asking us to sympathize with non-white characters through a white person’s eyes. If it jumps that hurdle, The Help deserves to be lauded for that simple feat, and then we can move on to the other plusses and minuses. If it doesn’t, then this will be a very short review. Thankfully, The Help clears the hurdle. It wisely uses a very talented ensemble to explore the racial tensions in early 1960s Jackson, Mississippi, and if there’s any complaint to be made it’s that the white characters get shortchanged here, rather than the other way around. But with talented actresses such as Emma Stone and Bryce Dallas Howard portraying the white leads and fleshing out the characters with their performances, any such complaint would be a stretch. Viola Davis steals the show as Aibileen, however. And this is the second film I’ve seen her run off with. Her performance in Doubt (which consisted of a single scene) was the highlight of an otherwise serviceable movie, and she shines here as well. The Oscar heat behind this will surely pay off very well for her. She was nominated for Doubt, but she’ll surely win for her work in The Help. Tate Taylor, who wrote and directed the film (adapting from Kathryn Stockett’s best-selling novel, which I have not read, for the record), is wise to rely on his actors but also wise to lean on the period setting, which is reproduced very well here without calling too much attention to itself. There’s no mention of hippies, Elvis, the Beatles, or any other obvious references to the period. The racial tensions are enough, and when the film brings in the assassination of JFK it influences the characters organically rather than feeling forced. 2011 has been a lean year for truly great cinema, but it has been plentiful when it comes to solid B+ pictures. The Help is such a picture, something you can comfortably watch with your family but also on your own. It doesn’t lack a brain or a heart, and it doesn’t have the self-important feeling that Amistad or something similar has. It is, quite simply, a good movie. The type that’s easiest to recommend and hardest to write a lot about. There’s solid themes, a good script, excellent direction, and enjoyable performances. Sometimes, that’s all a movie needs. 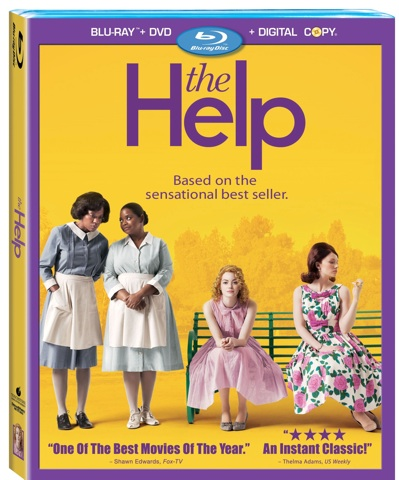 The Help arrives on BluRay and DVD on December 6th. You can pre-order the film right here. Comments for Blu-Ray Review: “The Help” are now closed.